The Jack Kerouac School of Disembodied Poetics at the Naropa Institute in Boulder was founded in 1974 by Anne Waldman and Allen Ginsberg. The essays, lectures, and interviews in this collection reflect the school’s major concerns: language, poetics, Buddhism, and the fate of the earth. Contributors include Amiri Baraka on the literary canon, Alice Notely on women poets and epic form, William Burroughs on screenwriting, and Allen Ginsberg and Clark Coolidge on Kerouac, among others. The school’s proximity to the Rocky Flats plutonian trigger plant provides the occasion for Anne Waldman’s grim history, “Rocky Flats: Warring God Charnel Ground.” This wide-ranging and thoughtful collection is recommended for academic and larger public libraries. 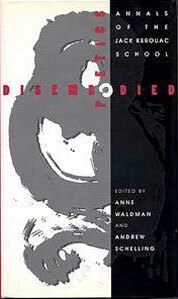 Where interest in the Beat Generation and avant garde American literature in general runs high, this collection of essays, speeches, interviews, and manifestos from the Jack Kerouac School of Disembodied Poetics–an annual summer gathering at the Buddhist Naropa Institute in Boulder, Colorado–will have appeal. The pieces are grouped in six sections: “The Activist Front” (Amiri Baraka, Peter Warshall, and a Randy Roark interview with coeditor Waldman); “Talking Poetics” (Nathaniel Mackey, Bernadette Mayer, Alice Notley, Jack Collom, Anselm Hollo, and Bobbie Louise Hawkins); “Gnosis” (coeditor Schelling, Lyn Hejinian, Peter Lamborn Wilson, Ed Sanders, and the coeditors’ interview with Philip Whalen); “Film” (a single essay by William Burroughs); “Ancestral Presences” (Susan Howe, Allen Ginsberg, Clark Coolidge, Leslie Scalapino, Nathaniel Tarn, Rikki Ducornet, Lorenzo Thomas, and David Levi Strauss); and “Documents from the Jack Kerouac School” (contributions from both coeditors, Allen Ginsberg, and Robin Blaser plus a “Counterpoetics Statement” and “A Declaration of Interdependence”). Some pieces have been published in small-circulation journals, but others were derived from oral presentations unavailable elsewhere.